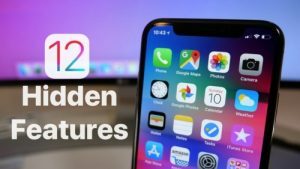 iOS 12 Secret Features: Update Your iPhone & Try These Hidden Features. You are here: Home / Weekly Columns / Opinion / iOS 12 Secret Features: Update Your iPhone & Try These Hidden Features. (ThyBlackMan.com) Now when iOS 12 is available to download, here are some new iOS 12 secrets features and hidden tricks that you probably didn’t know about. Apple talked about many features during its events this year, but some of the features it didn’t highlight and they are completely new and exciting. Here is a list of iOS 12 secret features you should try. Apple changed the way people used to secure their iPhones. Last year, the company introduced Face ID, a new way to keep your phone and data safe. Apple removed the Touch ID and after little criticism, the company successfully convinced everyone. The lack of support for more than one user was a drawback, but fortunately, we now have a new setting called Alternate Appearance. With this new option, users can easily add a second person or make their alternate profile for Face ID. In the list of iOS 12 secret features, this one deserves a mention. Earlier, you had to manually approve OS updates to be able to download them on your iOS devices. With the latest OS version, you can enable automatic updates and all the future updates released by Apple will be automatically downloaded to your device. People who are using two-factor authentication and using SMS codes to unlock their iPhone should feel relaxed. In iOS 12, with the new autofill feature, you won’t have to memorize the shortcodes as Apple has added a shortcut on the screen keyboard that allows you to autofill the code. All you have to do is to just tap the shortcut and your code will be filled. Now when law enforcement and hackers are able to crack iPhone passwords, Apple has added a new setting that allows you to restrict USB access. You can now disable USB access to restrict USB accessories from connecting when the device has not been unlocked for more than an hour. Just like many other iOS 12 secret features, this setting is already enabled by default, but if you wish to disable it, you can do that from the Touch ID & Passcode setting. There are moments when you don’t want to look at your phone. Let’s say you’re watching your favorite TV show, attending a meeting, having dinner with guests or enjoying a movie in a theatre, the iOS 12 has a new feature that helps you enable DND for a short period of time. Once you move out from that particular location, it will be turned off automatically. After updating to iOS 12 on your iPad, you won’t have to multitask to access the Control Center. Apple has added the same scroll-down functionality to iPads running iOS 12 similar to the one you see on the iPhone X. Now you can just tap and swipe down from the top right corner of your iPad’s display to access the Control Center features. The time and date have been moved to the other side like how they appear on the iPhone X and 2018 iPhones. In iOS 12, if you want to use the trackpad mode, you can do it. Just tap and hold the spacebar and you will be able to access trackpad. You won’t have to hold the spacebar for long as the iOS 12 doesn’t take time to switch between keyboard and trackpad modes. The best thing is, the trackpad behaves exactly in the same way the 3D Touch method works. If you are using an iPad, you can use the trackpad mode on that device as well. Screen Time is a useful tool if you’re motivated enough to use the data for your well-being. The feature offers tons of information about how you use your iOS 12 device. The feature is on by default. It tracks the apps you use when you use certain apps, and how much time you spend on apps. In one particular area, Apple beats Android’s well-being program. Apple allows users to block apps entirely. One thing that disappoints is the way Screen Time works. It is an independent feature and is not connected to the health app on iOS 12. So if you haven’t tried these hidden tricks and secret iOS 12 features, try now and if you find some more interesting features in the latest OS update, share in the comment section below.